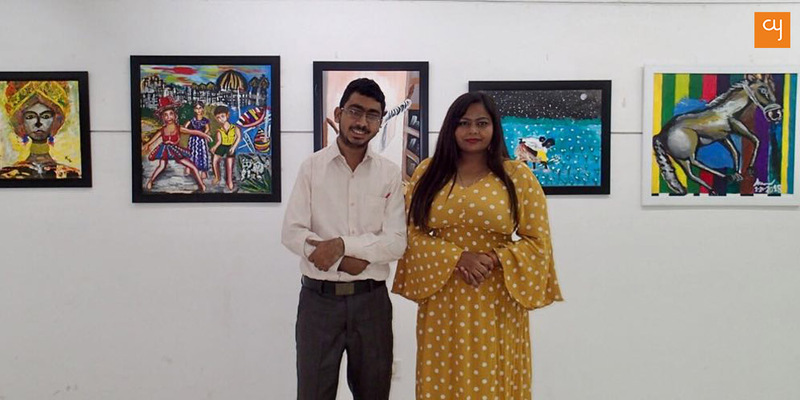 Find out how these four young artists explored their beliefs and concerns through the medium of art at their respective art shows held at Ravishankar Raval Kala Bhavan. Anklesh Nisad and Madhu Kailashi’s Estetik Arts explored themes of folk life and feminism; Alay Mistry played with geometry and scrap metal to give form to this thoughts whereas Gopal Parmar has enquired upon themes of urbanisation and deforestation in his prints and paintings. 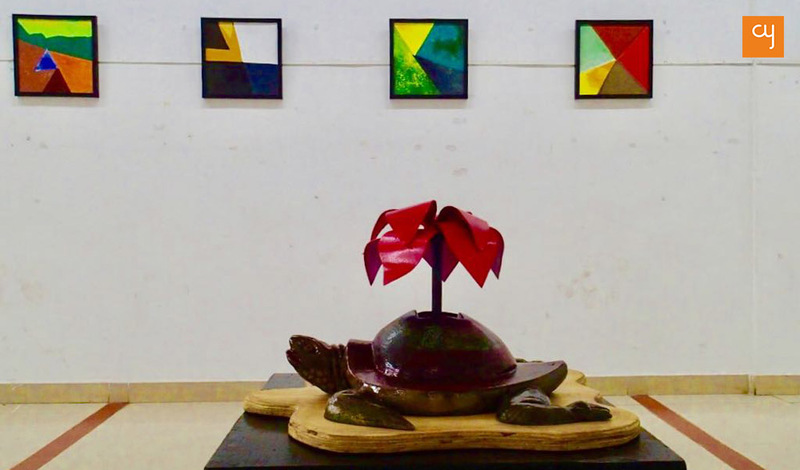 All of these were exhibited between October 25-28, 2018 in Ahmedabad. 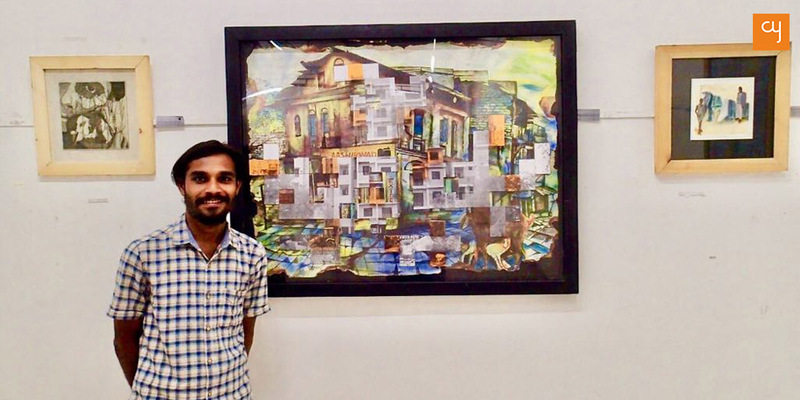 An architect by profession, Madhu Kailashi, exhibited for the first time in the art show titled ‘Estetik Arts’, along with artist Anklesh Nishad. Hailing from New Delhi, her interest in art started as a hobbyist, who made artworks primarily to gift loved ones. She moved to Ahmedabad upon her marriage with architect Manan Malviya, who persuaded her to exhibit her work. Her confidence grew and she launched the website www.estetikarts.com to promote and sell art to seeking collectors. In the show she has displayed 27 watercolour works, most of which are based upon the theme of feminism. Most of her work is figurative and describes various moods and forms of women in a aesthetically appealing way. It is an encouraging start, considering this is her first show. 26 year old Anklesh Nishad, though challenged by physical limitations, doesn’t let his imagination shrink by any means. His 17 artworks, watercolour on paper, are a credible proof of his artistic passion and understanding. 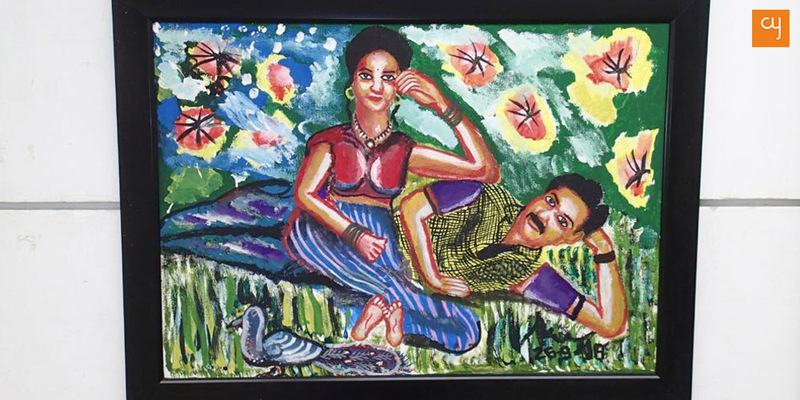 An alumnus of CN School of Fine Arts, Nishad’s art is vivid in its composition and colour play. The strong patches and bold strokes express his inner strength, and at the same time share his artistic vulnerability. His bright coloured palette, and a mix of folk & urban forms create an impressive repertoire, that has sparks of artistic potential. 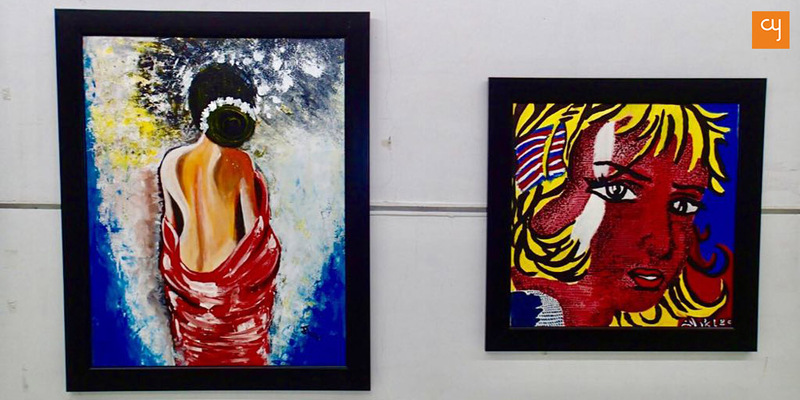 The proceeds of Estetik Art show, a major part of 70%, will be used for the benefit of underprivileged children of Dear Zindagi Foundation. As a child, Alay Mistry used to scribble a lot on the walls of his room and on his school bench. His teachers could see his love for drawing and encouraged him to pursue arts in a structured way. Later he joined a Paper-mâché course and a pottery course at the National Institute of Design in 1998. Mistry finds a lot of his inspiration from Egyptian pyramids, their scale, geometry, triangular form – it all influences his aesthetic sensibilities. The three points of triangle, as Mistry perceives them, denote Mantra (word), Tantra (process) and Yantra (tool), the three elements of Hindu life science. The paintings with trianglular geometry are all explorations of this understanding. However what caught my attention were the beautiful sculptures made from scrap metal. These sculptures are figuration of animals and birds, and have an emotive quality to them. The exhibition sponsored by Gujarat State Lalit Kala Akademi will travel to Bhubaneshwar at Orissa Modern Art Gallery on Jan 24. Hailing from Limdi, a small town in central Gujarat, Gopal Parmar is a perfect example of inborn artistry. He studied print making from MS University, Vadodara, and continued his practice under the guidance of Rakesh Patel, emerging artist in Ahmedabad landscape. His 40 artworks at his solo show at Ravishankar Raval Kala Bhavan are a mix of graphics, paintings, installations and mix media works. Though the medium and technique differs, Parmar’s artistic enquiry is focussed on deforestation and the residues of mindless urbanisation. Parmar’s exhibition was titled ‘Prabhyas…Y’, and shared gallery space with Alay Mistry at the Bhavan. 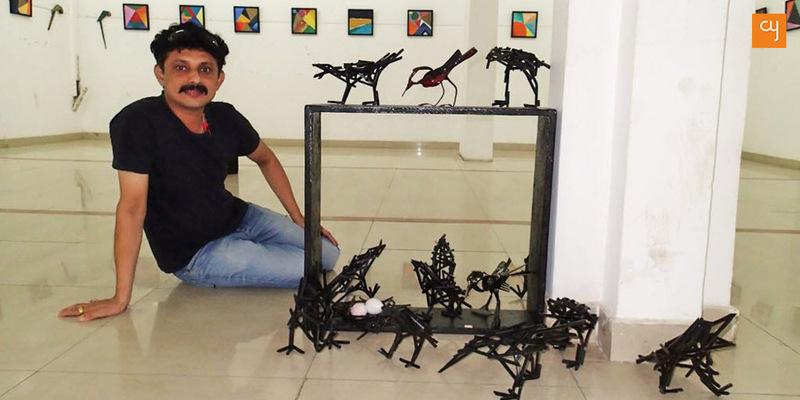 Each week Ravishankar Raval Kala Bhavan is filled with new exhibitions. The galleries are open all day, except Monday, between 11 am to 8 pm. You might be surprised to see what you encounter within these humble walls.